As of this week, the “Petitions of the week” post will replace the “Petition of the day” post. The now-weekly post functions the same way as its daily predecessor: It is a vehicle for identifying recently filed petitions that raise issues that have a reasonable chance of being granted in an appropriate case. As a reminder, we generally do not evaluate whether a petition is the appropriate vehicle to decide the question, which is a critical consideration in determining whether certiorari will be granted. This week, the Supreme Court has been presented with petitions involving issues such as whether the 11th Amendment prevents the entry of injunctive and declaratory relief in federal court against a governor, attorney general and state-court administrator to prevent the continued enforcement of a categorical and nonwaivable state ban against granting a legal change of name to any person who is not a United States citizen; and whether, under 8 U.S.C. § 1158(b)(1)(B)(ii), an asylum applicant whose testimony is deemed credible, but who the Immigration Judge determines “should provide evidence that corroborates otherwise credible testimony,” must be given the opportunity to obtain and provide such evidence. Issues: (1) Whether the 11th Amendment prevents the entry of injunctive and declaratory relief in federal court against a governor, attorney general and state court administrator to prevent the continued enforcement of a categorical and nonwaivable state ban against granting a legal change of name to any person who is not a United States citizen; and (2) whether the article III standing doctrines of causation and redressability bar the entry of injunctive and declaratory relief in federal court against a county clerk of court to prevent the continued enforcement of a categorical and nonwaivable state ban on granting a legal change of name to any person who is not a United States citizen. Issues: (1) Whether the Pennsylvania Constitution’s substantive provisions and whatever interpretation Pennsylvania courts afford them, however atextual, can restrict time, place and manner rules Pennsylvania’s lawmakers have passed to govern congressional elections pursuant to the elections clause of the United States Constitution; and (2) whether the Pennsylvania Supreme Court, which has no lawmaking authority, may, consistent with the elections clause, adopt a redistricting plan as a remedy solely for state-law violations and, if so, whether it may, consistent with the elections clause, craft redistricting wholesale in creating that remedy. Thole v. U.S. Bank, N.A. Issues: (1) Whether an ERISA plan participant or beneficiary may seek injunctive relief against fiduciary misconduct under 29 U.S.C. § 1132(a)(3) without demonstrating individual financial loss or the imminent risk thereof; and (2) whether an ERISA plan participant or beneficiary may seek restoration of plan losses caused by fiduciary breach under 29 U.S.C. § 1132(a)(2) without demonstrating individual financial loss or the imminent risk thereof. Issue: Whether the Occupational Safety and Health Act “preempts all state occupational safety and health laws” relating to issue covered by federal standards “unless they are included in the state plan,” as the U.S. Court of Appeals for the 9th Circuit has held; or whether a state may employ supplemental enforcement mechanisms for workplace safety standards even if not included in the state plan, as the Supreme Court of California held in this case. 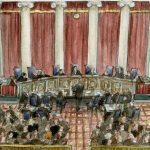 The post Petitions of the week: The new “Petition of the day” appeared first on SCOTUSblog.